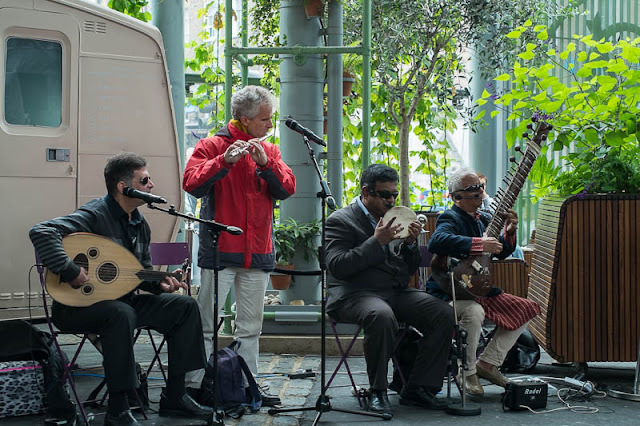 A quartet playing an arrange of unusual instruments entertaining the crowd at Borough Market yesterday. The group playing the tap footing joyful music are part of an orchestra from the Baluji Music Foundation. The foundation is the brainchild of Baluji Shrivastav an extremely talented instrumentalist from northern India. The schools he attended as a blind child recognised his extraordinary talent as a musician and encouraged him to further his studies at top music universities. He has gone on to tour the world, write music for films, television and theatre, he has performed around the world and recorded with the likes of Stevie Wonder and Annie Lennox. The Baluji Music Foundation is a charity he has set up for blind and visually impaired people offering them to play and enjoy music at any level. A nice photo and I like the place. I am not sure this is my kind of music, but the idea of that foundation is great! What a fascinating experience this would be to hear. These guys have vision in the best sense. I love hearing stories like this. I'm sure that music would have drawn me right to it.